This shoes cost $3,000,000. Inspired by yesteryears’ iconic movie star Rita Hayworth, this Weitzman and Le Vian creation uses as it’s drool factor a pair of earrings owned by the Hollywood legend. The deep chocolaty colour is refreshing change from the usual stark bright tones used in many Weitzman creations, and the folded satin flowers cradling the chunky earrings are a style statement in themseves! 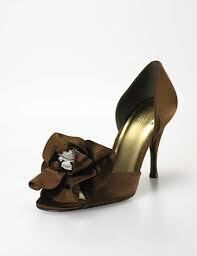 Kathryn York was the lucky woman to wear these peep-toes at the 2006 Academy Awards. Each leather shoe, adorned with a host of precious stones including sapphires, diamonds, rubies and diamonds is a representative of larger-than-life glamour and sheer style. The pair now belongs to Hayworth’s daughter, Princess Yasmin Aga Khan. 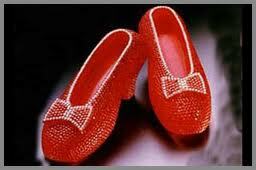 The fascination of footwear designers with “The Wizard of Oz” continues over decades. Celebrated jewellery designer Harry Winston’s son Robert in 1989 wished to commemorate the fiftieth anniversary of the classic movie in his own ostentatious fashion with a recreation of the hallowed “Ruby Slippers”. A painstaking two months was spent in carefully crafting a pair of shoes that out of four thousand and six hundred rubies and fifty carats of diamonds. After about sixty days, the opulent heels, glittering in all their glory, were unveiled at the House of Harry Winston, accompanied by a price tag of no less than three million- the most expensive shoes in the world!